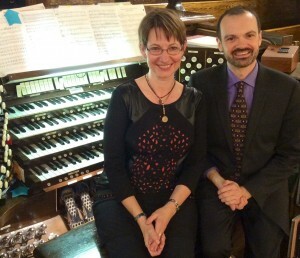 Meet your Calgary Organ Festival maestros: Chellan Hoffman and Neil Cockburn. Happy Halloween! Big night for Calgary Organ Festival tonight with two great events at Knox United. 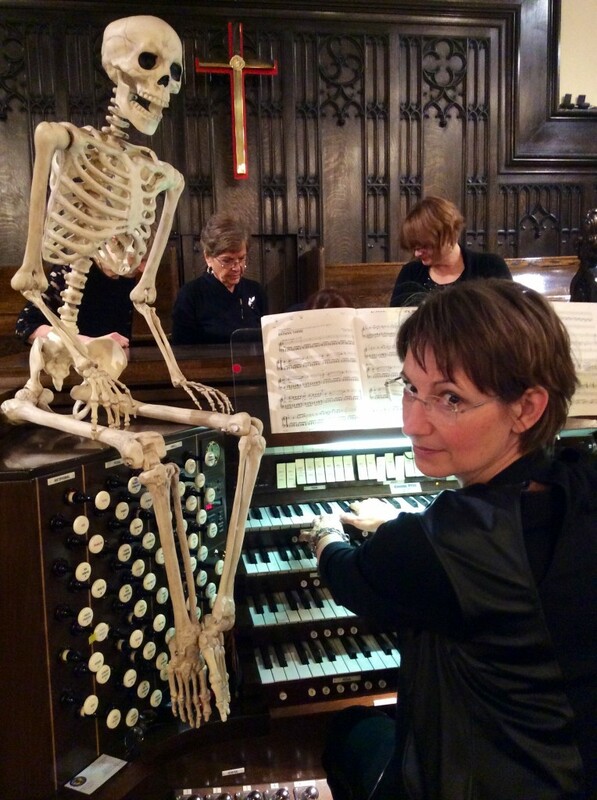 We asked music director Chellan Hoffman why organ music is so perfectly spooky for Halloween. The organ is a mysterious beast. It’s complex, it’s elusive, it’s unique, it’s powerful. Hollywood/movie pop culture has often used the organ to set the mood for something mysterious or scary. Is it because the organ console itself is such a complex machine that it looks like a science experiment? Is it because the pipe organ has lungs that send air up to the pipes? Is it because the organist looks a bit like a mad scientist when he/she pulls stops and plays the pedals and keyboards with all available arms and legs? Is it because the pipe organ can produce such a loud, monstrous, resonant sound that the windows rattle, the chairs vibrate and the floorboards shake? Or is it because the organ pipes can produce such a hushed and ethereal sound that it could well be the whisper of ghosts and spirits in distant rooms? Is it because this large instrument seems to be able to hide? Organs usually reside in large buildings, and if you want to find one, you have to snoop and search. In the dark, usually. The organ console waits silently behind a wooden screen, a cement wall, a dark corner; it crouches in basements and pits, far away from light switches; it perches in high balconies that can only be reached by creaky, winding staircases! Hundreds and hundreds of pipes (the vocal cords of the organ), inhabit the empty spaces of the building. Like little mice and big goblins, the pipes are behind walls, up in attics, and under the floorboards. You can’t always see those pipes, but you can hear their breath, and feel their vibrations. Maybe Hollywood knew it all along: THE ORGAN IS ALIVE! IT’S ALIVE! Hear Montreal’s Luc Beauséjour tonight. 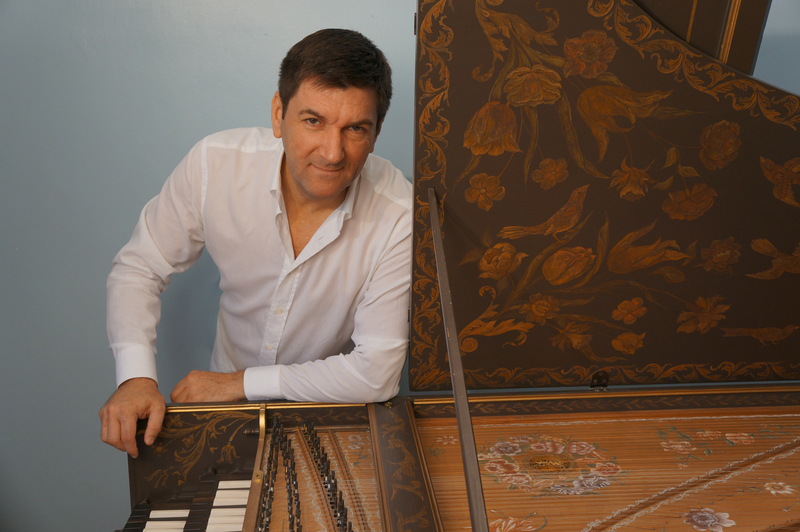 Award-winning harpsichordist and organist Luc Beauséjour is renowned for the elegance, virtuosity, and expressiveness of his playing, which has won him an enthusiastic audience and the continuing praise of critics and music specialists. Beauséjour performing schedule sees him travelling throughout Canada, France, the United States, Austria, Germany, Hungary, Belgium, and Bermuda. He has performed in Paris, Boston, Washington D.C., Vienna, Munich, and Montreal, as well as at numerous festivals, including the Festival d’Uzès (France), the Lanaudière International Festival, the Festival d’Ambronay, the festival Un été à Bourges, the Lamèque Early Music Festival (New Brunswick), and the Vancouver Early Music Festival. He was invited to perform the Goldberg Variations at the Glenn Gould Studio in Toronto for a CBC commemoration of the great pianist’s birthday—testimony to the recognition he has earned as one of Canada’s finest musicians. He is also heard regularly on both CBC and Radio-Canada. He was born in Rawdon, Quebec, and holds a doctorate from the Université de Montréal. He studied harpsichord with Mireille Lagacé and organ with Bernard Lagacé. He also trained in Europe under Ton Koopman and Kenneth Gilbert. He was first-prize winner of the 1985 Erwin Bodky International Harpischord Competition in Boston, he has also won prizes at several other competitions and received a number of grants from the Canada Council and the Conseil des arts et des lettres du Québec. Mr. Beauséjour teaches harpsichord and organ in Montreal. What a great way to start Organ Festival! Eckhardt-Gramatté Hall, Rozsa Centre, University of Calgary, 206 University Court N.W. Tickets: $25 regular, $18 student/senior. On sale at the University of Calgary Campus Ticket Centre. This event is hosted by the School of Creative and Performing Arts (Music) of the University of Calgary. Mount Royal Conservatory’s Neil Cockburn is head of Organ Studies, the campus carillonneur, and artistic director of the Calgary Organ Festival, which begins this week. Click here for full schedule. 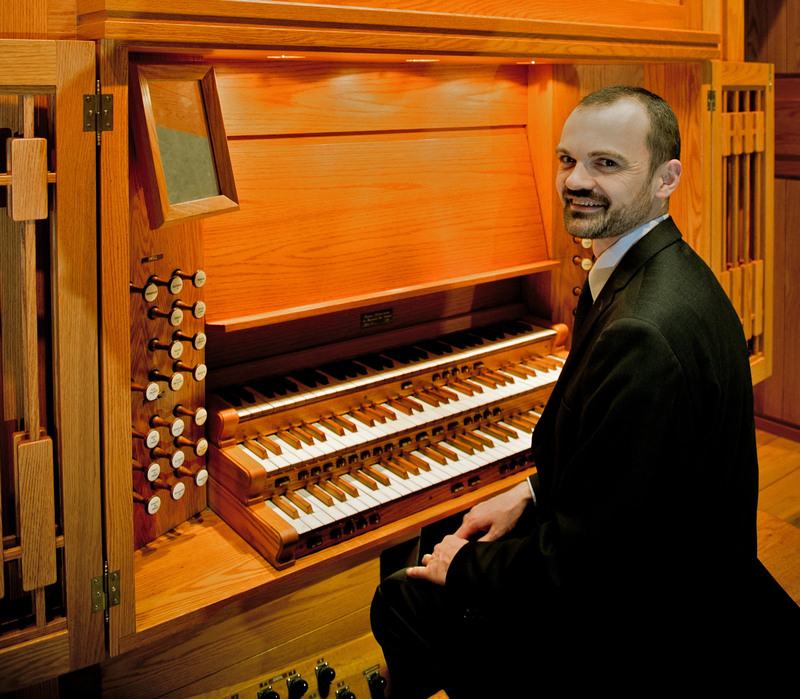 International prize-winning organist Neil Cockburn wears many hats. He is head of Organ Studies at Mount Royal Conservatory, artistic director of the upcoming Calgary Organ Festival, and director of Mount Royal Conservatory’s Purcell Ensemble. He is also the continuo player and organist for the Calgary Philharmonic Orchestra. Neil Cockburn performing at a free, monthly recital inside Wyatt Recital Hall at MRU. Soloist, recitalist, accompanist, and orchestral musician – Cockburn does it all. He has been a central figure developing musical culture of the pipe organ in Calgary and Western Canada since 2000 when he took the helm at Mount Royal’s organ studies. 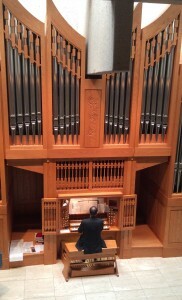 On the Mount Royal campus, he offers free lunch-hour organ recitals in Wyatt Recital Hall on the second Thursday of each month. It’s high time to pull back the curtain and learn more about Cockburn. He was born in Scotland and began playing the organ at 13. He studied music as an undergraduate at Oxford University and Organ Scholar of Keble College, and then went on to earn his master’s degree in organ performance at the Royal Northern College of Music in Manchester, U.K. He also studies at the Conservatoire Nationale de Région Rueil-Malmaison in France before earning a PhD in musicology at the University of Calgary. He won first prize at the 1996 Dublin International Organ Competition, and has received numerous other prestigious awards. He has performed in the United Kingdom, Ireland, France, Sweden, the United States, Canada and South Africa. 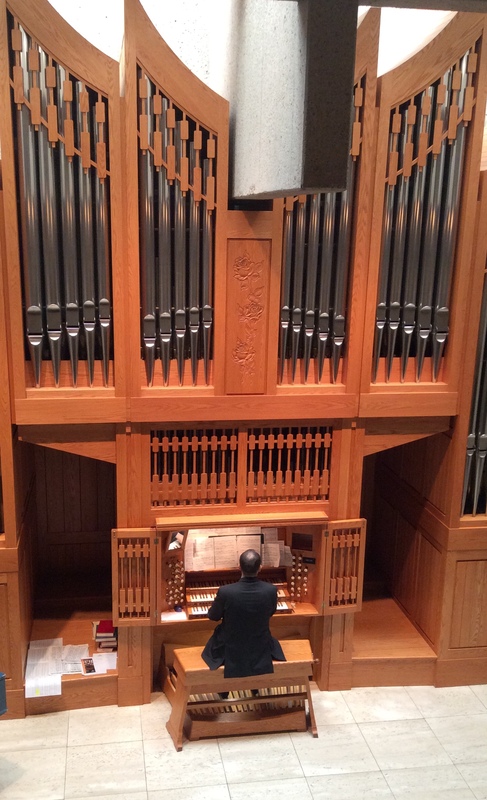 With the Calgary Organ Festival beginning this week, Cockburn reflected on the past five years.